Austin, Texas: University of Texas Press, 2004. This is the full and detailed view of the first edition of Rio Grande, edited by Jan Reid, which contains, on pages 18-20, an excerpt from Tony Hillerman's book New Mexico, Rio Grande, and Other Essays (1992). This edition was published by the University of Texas Press in Austin, Texas, in 2004. Tony Hillerman's excerpt is illustrated with a photograph by Laura Gilpin. This is a hardcover book with a dust cover. 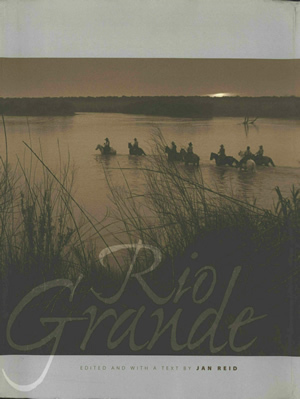 The cover image, wrapping from the inside front flap around the front cover and spine to the back cover, is "Crossing the Rio Grande" by Bill Wittliff. The section on the front cover shows a group of people on horseback crossing a wide body of water. The inside front flap contains a description of the book's contents which continues onto the back flap. The back flap also contains the editor's biography. The front cover photograph continues onto the back cover, ending about two-thirds of the way across. Below the photograph is the publisher information and bar code. The inside front and inside back covers are blank. The endpapers are dark taupe. Binding: Black cloth-covered boards. The title is embossed on the front cover. The author's name, title, and publisher's logo are printed on the spine in silver.